I love carnations. They are the perfect vase flower since they seem to last forever. 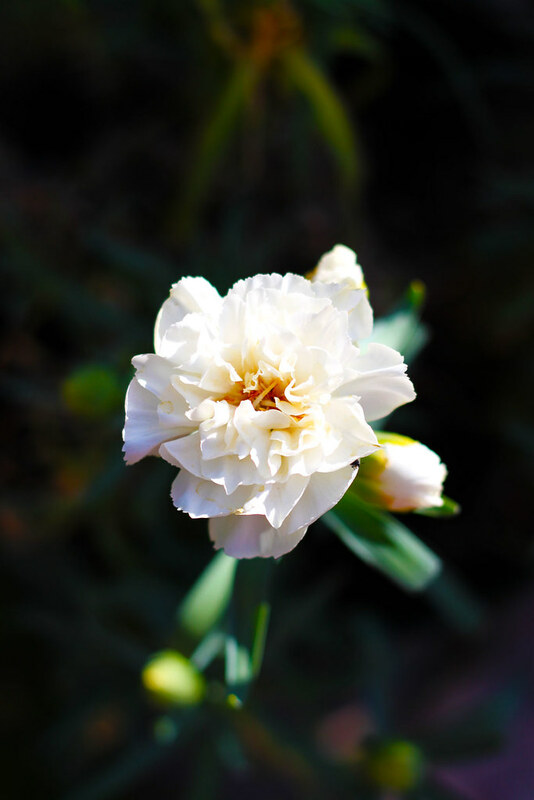 I have one potted white carnation that has a beautiful scent. I had a weird experience at the fabric store today. A friend, our sons were in high school band together, is the manager of the Viking Sewing Center within our neighborhood JoAnns. She had a lady there that was going to teach sewing classes for her. This woman asked me how to sew in a collar. She is the instructor. She said she has taken classes with Palmer and Pletsch and Martha Pullen, but they have never gone over collars. Then she said she would take a class to learn how to sew the shirt I was wearing. I make my own shirts. It just surprised me, a sewing instructor who had never sewn collar. It just seems so basic. This entry was posted on Saturday, May 30th, 2009 at 3:00 am and is filed under Garden and Sewing. Tagged: Garden, Sewing. You can feed this entry. You can leave a response, or trackback from your own site. Yes, that does seem basic. I’ve run into talented knitters who know of only one cast-one or bind-off. Knowing how to to do several techniques in both seems basic to me. And it makes me wonder what basic things I’ve missed.